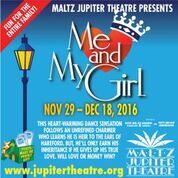 Me And My Girl Opened on Dec. 1st at The Maltz Jupiter Theatre to a standing ovation. Reviews were raves. So proud and happy to have been a part of this first class Broadway caliber Production.